Peachjar Announces The 2017 Peachjar Playmakers, Awards 5 Youth Impact Programs Across the U.S.
Peachjar’s K-12 parent engagement platform has digitized the paper flyer business in over 10,000 U.S. schools, now bringing information about youth enrichment programs via email to parents across the country. According to the Afterschool Alliance, students who participate in afterschool programs see improved grades and work habits, and have higher graduation rates. With most states continuing to cut school funding, programs relating to arts, music, sports, and any number of other categories are impacted, making the importance of these afterschool and enrichment programs ever greater. Thousands of afterschool and student enrichment programs send digital flyers through Peachjar each year for parents to see and get their children involved in. Peachjar recently worked with school districts around the U.S. to acknowledge and reward the tireless efforts of these programs. With most states continuing to cut school funding, programs relating to arts, music, sports, and any number of other categories are impacted, making the importance of these afterschool and enrichment programs ever greater. 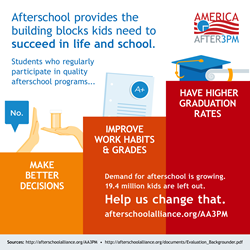 In addition, the benefits of these programs are clear- according to the Afterschool Alliance, students who participate in afterschool programs see improved grades and work habits, and have higher graduation rates. Peachjar is therefore proud to announce the first annual Peachjar Playmaker Awards, with 5 winners each nominated by their school district’s communication team for the degree of positive impact their programs have had in their communities. The winning programs each receive a significant marketing budget to use on Peachjar’s platform, as well as a $500 contribution to their not-for-profit organization from the Clark-Fox Family Foundation in St. Louis, MO, a recently announced Peachjar partner. The Clark-Fox Family Foundation supports K-12 public education initiatives and is closely aligned with the values and goals of Peachjar in giving parents access to quality information to guide their children’s education. Founded in 1976, the ASA is a non-profit youth sport organization with over 6,500 supporting volunteers. ASA provides quality sports and recreation annually for over 15,000 children of all levels of experience who reside in Allen, Lucas, and Fairview, Texas, offering programs like baseball, basketball, cheerleading, football, and more. Art Smarts offers afterschool art lessons to students in 15 schools in Southern California. Art Smarts helps them to expand their horizons for their future success in life by demonstrating to them how many different kinds of artists make a living with various types of artwork. Since 2000, radKIDS, Inc. has provided education that enhances the ability of children and parents to protect themselves from violence. 250,000 children have since been trained in radKIDS’ personal Empowerment Safety education program, 96 of whom were threatened with abduction and used their skills and returned safely to their families. Since 2008, Micah’s Backpack has addressed issues of child hunger by partnering with local schools to provide direct assistance to students who qualify for the free lunch program. Each week during the school year, identified students receive a backpack filled with enough food for the whole weekend. Since 1995, KEYS has worked in the Warsaw community to provide students with leadership and community service skills. Students serve in KEYS from 8th grade through graduation from high school, meeting annually to evaluate teachers’ grant applications, distributing $20,000 of foundation funds to winners. They also give back to the community through programs like Read Across Kosciusko County. To learn more about the 2017 Peachjar Playmakers, find out how to donate to them, or otherwise help these programs, visit http://info.peachjar.com/2017-peachjar-playmaker-winners.